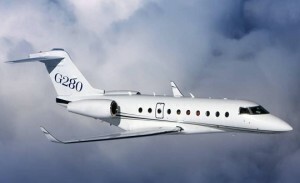 The Gulfstream G280 joined a small but growing list of aircraft that are subject to special conditions from the FAA meant to prevent unauthorized “connectivity to, or access by, external systems and networks.” An FAA spokesman told AIN that “similar cybersecurity protection special conditions have already been applied” to the Airbus A350; Boeing 767-2C, 787-8 and 747-8; Bombardier C Series; Embraer Legacy 500; and Gulfstream G650. “Whether or not these aircraft are fly-by-wire is not relative to application of these special conditions,” he added. 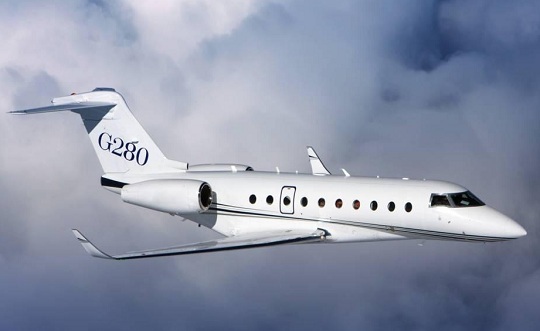 The cybersecurity special conditions for the G280, published this week in the Federal Register, have already been addressed, according to a Gulfstream spokeswoman. “The G280 meets the requirements of the special condition as part of its compliance to type design,” she told AIN. Since the G280 has a fly-by-wire rudder and roll-assist spoiler system, as well as an integrated modular avionics system, “The FAA’s concern stems from any product incorporating such systems and includes ensuring that any essential systems that are dependent on a network are protected from electronic intrusion, inadvertent or otherwise,” she noted. Gulfstream says that the super-midsize G280, which received provisional certification in December, is on track to receive full FAA type approval within the next month or so. Despite a “challenging” European economy, the 12th annual European Business Aviation Convention & Exhibition, which concluded last week in Geneva, “was one of the strongest EBACE shows yet, demonstrating its value,” organizers NBAA and EBAA said. The show attracted 12,638 attendees from 99 countries–both numbers on par with last year’s show. Some 491 exhibitors occupied a record-breaking 2,280 booth spaces at the Geneva Palexpo convention center. The show’s static display area, which was 10 percent larger than last year’s, presented a record-setting 60 aircraft. EBAA president Brian Humphries, EBAA CEO Fabio Gamba and NBAA president and CEO Ed Bolen were all pleased with the show’s strong outcome. “This year’s show was a tremendous success,” Humphries said. “The numbers demonstrate that EBACE remains the most important European business aviation event, even in–and perhaps especially in–tough economic times in the region.” Gamba agreed: “We’re delighted with the excitement and enthusiasm that surrounded this year’s show.” Next year’s EBACE show in Geneva will return to its Tuesday through Thursday format, running from May 21 to May 23, 2013. JetOptions‘ Vice President of Sales, Gus Lira, was in attendance. Six months after launching its midsize Citation Latitude, Cessna Aircraft today at EBACE announced a $25.9 million stretched version–the Longitude–that will fly 4,000 nm at Mach 0.82. First flight is scheduled for 2016, with entry into service in 2017. “The aircraft is long on range, high on value and low on price,” Cessna president and CEO Scott Ernest said at the unveiling. The super-midsize Longitude uses the same fuselage cross-section, windows, passenger seats and aluminum construction as the smaller Latitude, but will be nine feet longer. This gives it a 31-foot flat-floor cabin with passenger seating for eight. Mtow is projected to be approximately 55,000 pounds. The Longitude will be powered by a pair of Fadec-controlled, 11,000-pound-thrust Snecma Silvercrest turbofans with autothrottles, making it the launch platform for the engine. Cessna has selected the Garmin G5000 flight deck, using the same three-screen touch control avionics architecture that the company is using on both the Latitude and Citation Ten. The jet’s cabin management system will be built on the new wireless Clairity system that Cessna is developing for the Latitude, Ten and M2. 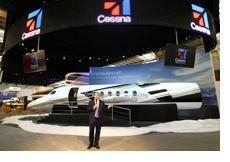 Cessna plans to build the Longitude in Wichita. Notably, “This is not the large-cabin jet that we’ve talked about building in China with our partner AVIC,” Ernest told AIN. “That aircraft will be something different,” though he would not elaborate further. NBAA and the European Business Aviation Association are gearing up for the 12th annual European Business Aviation Convention & Exhibition (EBACE), which starts on Monday in Geneva. 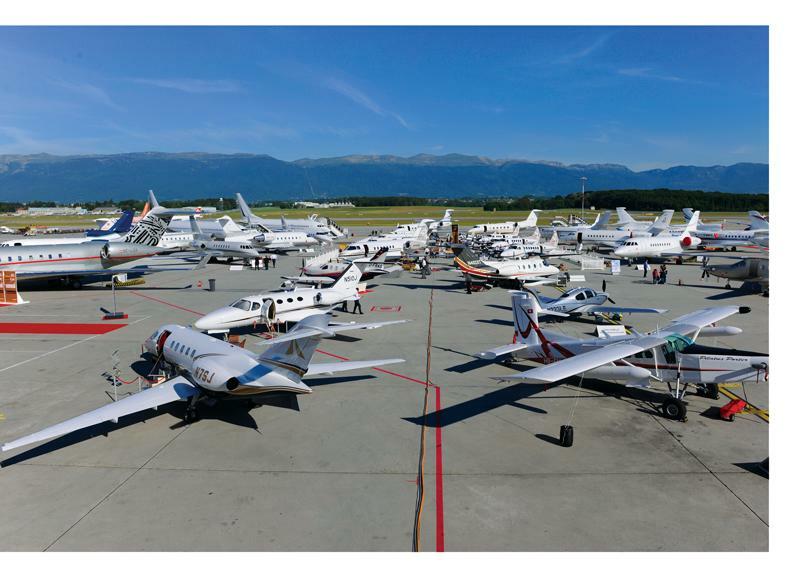 “From a number of measures,” an NBAA spokesman told AIN, “it’s clear that this year’s EBACE is shaping up to be as strong as or stronger than last year’s show.” There are now nearly 500 exhibitors signed up for the three-day show. Though there will be about the same number of aircraft on the static display as last year, the static ramp will be expanded by 43,000 sq ft to accommodate the influx of larger business jets. Overall, the static area will encompass some 60 aircraft over 4.3 million sq ft. The opening general session on Monday morning will feature Matthew Baldwin, the European Commission’s director for aviation and transport policy; Marian Jean Marinescu, a member of the European Parliament; and Salvatore Sciacchitano, executive secretary of the European Civil Aviation Conference. There will also be a wide array of business aviation-focused education sessions held during the show. AIN’s on-site EBACE coverage will begin Saturday morning on AINonline. Additionally, AINalerts will be published daily next week to bring the top EBACE headlines to your inbox. And if you’re attending the show, be sure to pick up copies of AIN’s printed EBACE Convention News issues on Monday, Tuesday, and Wednesday. JetOptions Private Jets’ Vice President of Sales Gus Lira and Vice President of Marketing, Jay Lira will be attending the show in Geneva. The northern hemisphere’s busy summer period for private charter flights has yet to take off, but demand levels are already ahead of 2010 figures, according to the latest data from online charter portal Avinode. As of yesterday, the company’s forward-looking demand index stood at 146.47, more than four points down from a month earlier, but almost four points up on where it had stood exactly 12 months ago. Avinode’s price index showed a similar trend, with global demand for a 30-day period starting on July 4 at 98.29, almost three points up from last year, but down slightly from last month. The company’s latest actual average flight-hour rates paid also show continued moderate instability in market conditions. In North America, rates for three sample aircraft types as of July 4 were down by between 4.5 and 6.1 percent from where they had been on June 4 and were also about the same degree lower than the rates recorded three months earlier. 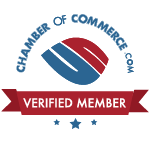 The average July 4 rates were as follows: Cessna Citation Excel, $3,283; Hawker 800, $3,492; and Challenger 604, $5,045. In international charter markets, rates for both the Hawker 800 and the Challenger 604 were down marginally–€3,002 ($4,322) and €4,729 ($6,809), respectively–but Citation Excel rates, at €2,804 ($4,037) per hour, were 3 percent higher than a month ago and up 6.8 percent from a year ago. The Florida Aviation Trade Association is holding a breakfast program to promote general aviation to non-aviation businesses and residents during its annual meeting next month in Sarasota, Fla. The free presentation, to be held at 8 a.m. on June 15 at the Ritz-Carlton Sarasota, will inform attendees about the “positive and significant ways” general aviation affects their lives on a daily basis. JetOptions will be in attendance.